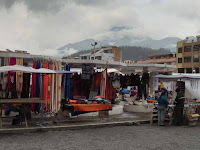 This adventure tour will be an introduction to life in the Andes on top of the Equator, a journey of discovery to old historic towns, small villages, markets, local indigenous people, their music and culture, ancient ruins, lakes, waterfalls and hot springs, with the ever-present views of the snow-capped volcanoes of the high Andes. The suggested itinerary can be modified according to the traveler's individual interests (birds, plants, Spanish language, hiking, geology, art, culture, photography, etc). Cost of $800/person for the 2-week journey includes lodging, breakfasts, taxis, guides, and one-way air travel from Cuenca to Quito. Lunch/dinner, bus fare, entry fees and beverage costs are not included. RT airfares from Seattle range from $600-$800 per person, so the total trip cost can be under $2000. Trips are limited to 4 people and can be arranged anytime in the spring and fall months. Ecuador is safe and clean. Roads are good, buses very modern. They use the US dollar, so no need to exchange money. Hotels and restaurants all meet international standards of quality. On this tour, we will stay in nice locally-owned hotels, all rooms with private baths, and visit places above 7,000 ft in elevation where mosquitoes and other insects are not a problem. Being high on the equator, day time temperatures are usually a pleasant 70 degrees F. Food is a very good combination of tropical fruits, soups, rice, quinoa and potato dishes, tamales, empanadas, fresh bread, seafood and local trout. Day 1: Arrival at the modern, new Quito airport and drive one hour to the small town of Cayambe near the third highest peak of Ecuador. Day 2: Visit the monument at Mitad del Mundo - Latitude 00°, at the Quitsato Complex in Cayambe, where you will learn how the ancient cultures used the sun and stars to guide their daily lives. Views of the volcano Cayambe can be seen, its glaciers are on the equator at 19,000 ft. The area produces a large variety of roses that are sold all over the world. We will visit the town center, historic church and local markets, and sample some foods, including the local specialty, biscoches with cheese. Day 3: Travel via a 10,000 ft pass to the indigenous town of Otavalo, where we stop for views of Lago San Pablo and several 17,000 ft high volcanoes. Descending into Otavalo, we pass small villages and see the local Quechan Indians wearing their traditional dress in their daily lives. The town center is a picturesque historic area with the municipal building, old churches and a pleasant park with vendors and traditional music. 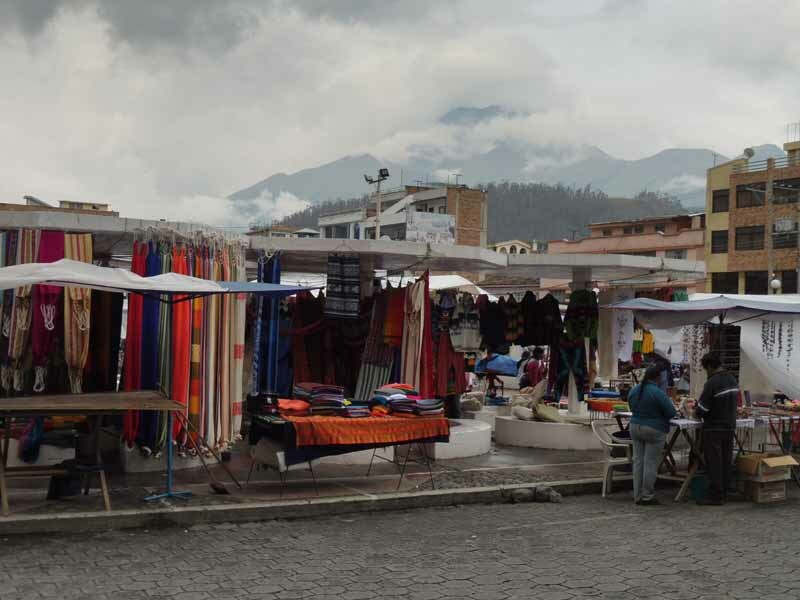 Nearby Plaza de Los Ponchos is the famous handicrafts market where villagers come to sell high quality handmade goods. We will visit the local Ecuadorian Red Cross to hear how the earthquake relief efforts are going and make a donation to their efforts. Other markets are close to the hillside, such as Copacabana market for fruits and vegetables. Ascending the stairs above we can reach the Balcon de Otavalo area, location of a cultural museum and great views of the town and Cotacachi volcano. 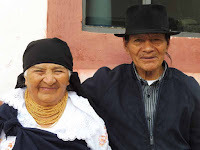 Evening meal will feature a restaurant with extensive views and musicians playing Andean music. Day 4: Breakfast of eggs, fruit, freshly baked bread, and juice. Spanish language instructor, Tania Filios, will join us to answer questions about the local beliefs and legends. We will visit Peguche, a small town whose inhabitants are famous for weaving on hand made looms in vivid colors. Nearby we will walk through eucalyptus forests to Peguche Falls, a natural area with trails, camping, traditional sites and caves. A short drive from here is the Parque del Condor, for seeing condors, eagles, owls and hawks. 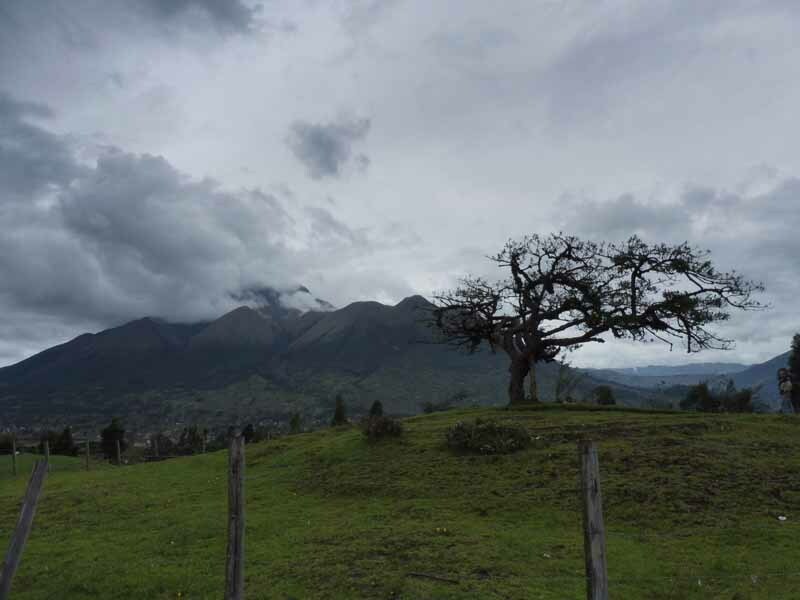 Nearby is El Lechero, a sacred site of an old lechero tree with magical healing powers. The lake is just below us here and volcano Imbabura stands tall at 17,000 ft. We will descend to the lake and travel to San Pablo village to visit a small coffee shop run by three friendly sisters who will give us practice in speaking South American Spanish. 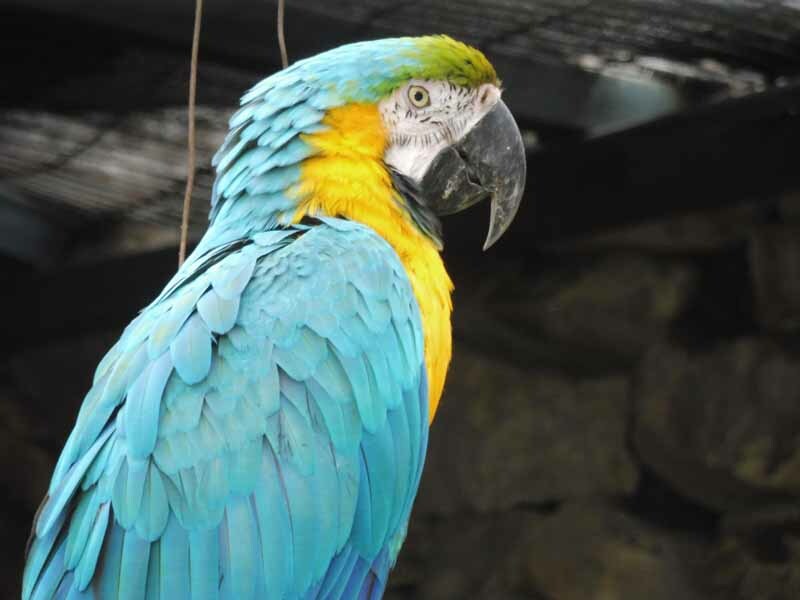 Day 5: We travel to the nearby town of Cotacachi and stay among the gardens at the Oro Azul B&B. Our driver will take us to Lago Cuicocha, a 2 mile wide crater lake at the foot of Cotacachi Volcano. There is an island in the middle of the lake in the shape of a guinea pig, with boat rides to it. There are viewpoints and hiking trails here, as well as a small visitor center on the misty slopes of the volcano. After our hike, we can eat some fresh trout and fruit juice at a new restaurant built by a local Quechan family. 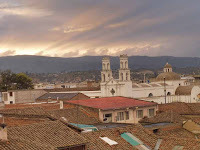 In the afternoon we will see the city of Ibarra, with its 3 cultures of Quechan, African-Ecuadorian and Mestizo, and drive uphill to Chachimbiro hot springs for a relaxing bath with a view of snowy peaks in the distance. Day 7: A ride on the new Teleferico of Quito, the highest cable car in the Andes. It reaches 12,000 ft and offers extensive views of the Avenue of the Volcanoes. Here the moors of Pichincha volcano are full of hiking trails, bike riding and horse rides. After enjoying the high altitudes of this area, we will continue our travels to Latacunga at the base of the beautiful Cotopaxi volcano, 2nd highest in Ecuador. This is a popular place for visitors and the town has charming narrow streets, old hotels and excellent restaurants. 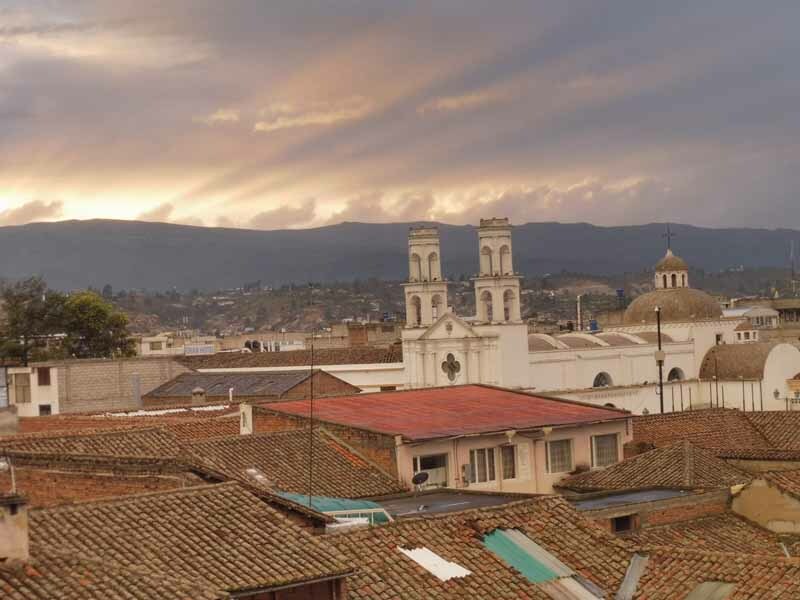 In the evening we can watch the sunset on Cotopaxi from a rooftop viewpoint. Day 8: One hour travel by bus through high passes and rugged hills to a nearby crater lake. Quilotoa is an 820 ft deep water-filled caldera with an amazing greenish color. We can hike down to the lake, and can go kayaking there or ride back up on a horse. The hostals here are very nice and rustic, built by local families of a different Quechan speaking band. We will spend the night here, at 12,000' elevation, to catch the incredible view of the sunrise over the crater in the morning. Day 9: After breakfast we continue toward Ambato with views of the active Tungurahua volcano, with almost continuous eruptions over the past 12 years. 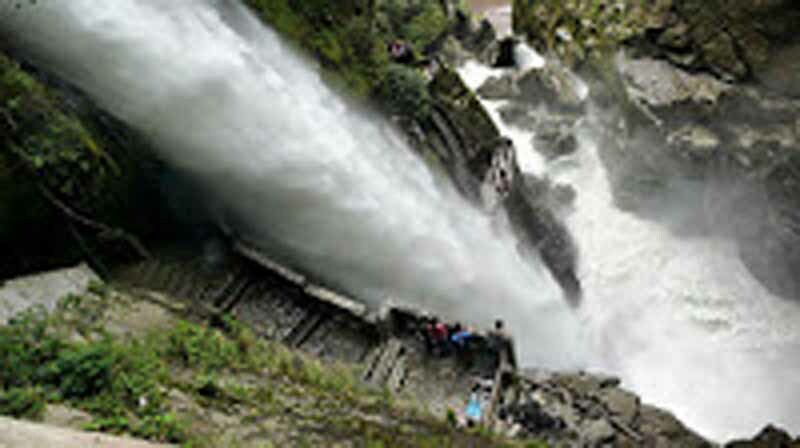 Another hour past Ambato takes us to the resort town of Banos, famous for its hot springs and waterfalls. 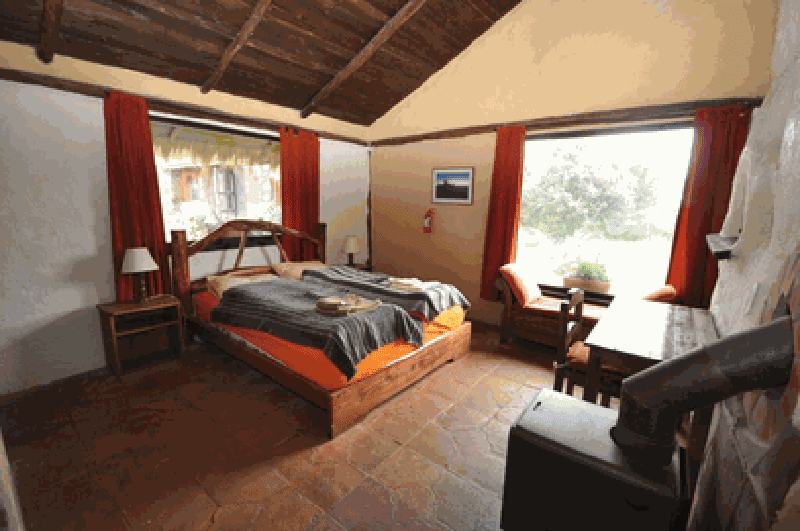 Our lovely hostal rooms will have a view of the Cascada de la Virgen next to the hot springs. This town is one of the most popular tourist attractions in Ecuador due to its amazing natural beauty, 60 waterfalls, birding and adventure sports, such as rafting, kayaking, canyoning, bridge jumping, hiking, biking and horseback riding. In the evening a high viewpoint can be visited for watching the ash and lava flows of the volcano. Day 11: Continuing south from here we will pass by the highest peak of Ecuador, Chimborazo at over 20,300 ft high. We reach Cuenca in the afternoon and visit the central area around Park Calderon. We will walk on scenic cobblestone streets, see the cathedral and splendid domed churches, ornate colonial buildings and antique ironwork. The city is lit up at night for some great photography and offers many places for fine dining and interesting street food. Day 12: Explore more of the beauty of Cuenca, the four rivers that run through the city, and its easy-going tranquil atmosphere. The city was founded by the Spanish in 1557, but people have lived in the area for thousands of years. There is Pumapungo Museum and Arqueological Park and small aviary - located near the bike path close to the river. Several buildings in this area were built on top of the old Inca ruins. Now the area is excavated and visitors can see the walls of the old constructions. 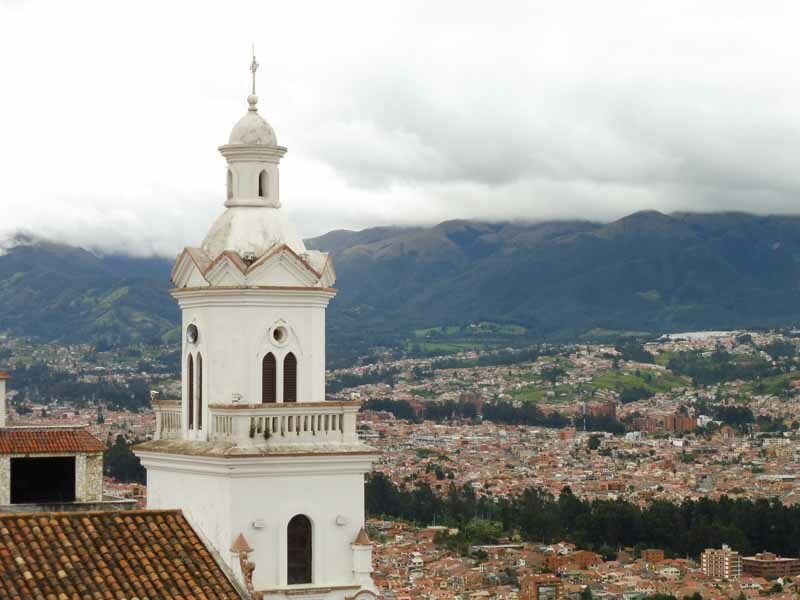 In the afternoon we can hike or taxi to the Balcon of Cuenca to see a great view of the city. 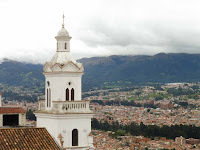 Day 14: Our final day in Cuenca and a short flight to Quito airport with views over the Andes. Arrival at the airport and transfers to the international flights back to the US, or add on your own trip to the Galapagos or Amazonia. We know you will be enchanted by this visit to Ecuador! !